While Coachella brings the crowds to the Empire Polo grounds for two weekends each April, it's usually the first weekend that gets all the attention. Brand activations, parties and infamous Instagram havens like REVOLVE's annual setup create an air of exclusivity, a level of thirst for invite-only seen-to-be-seen events. But while some of the hype isn't available for everyone, the Coachella Day Club has announced its return – and openness to the public – to the pool at the Hilton Hotel Palm Springs on April 12-14 and April 19-21. The pool party will invite impressive artists for such an event – including Nora En Pure and Diplo among others. The even is 21+, with $20 day tickets available along with further details here. And if you can't make it down to the desert, Goldenvoice is taking advantage of that notorious radius clause and offering a redeemable spread of local shows in California, details here. 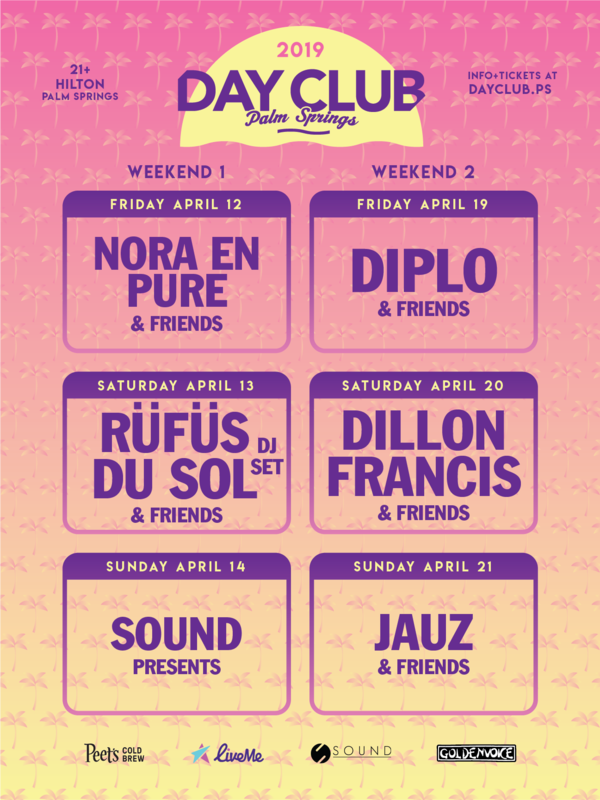 Check out the lineup details for Coachella Day Club below.